Advanced laser dentistry such as the Waterlase from Biolase Technology has basically eliminated the pain that has been so closely associated with dental care. Instead of the traditional dental drill, Waterlase uses high powered, laser-energized water. There is no heat or vibration within the mouth. Instead, the Waterlase relies on speed and precision to gently and quietly cut teeth. The high-powered laser is effective at cleaning out debris and bacteria from the mouth, acting almost like a mini power-washer. Some procedures done with Waterlase can even forgo local anesthetic, making it a great option for quick, non-invasive cavity removal. If you’ve avoided the dentist out fear or anxiety, Waterlase may be the ideal dental treatment for you. 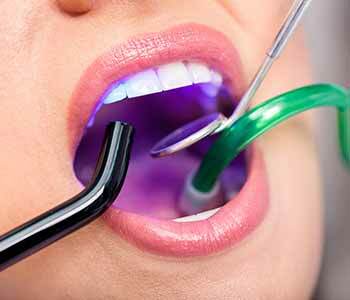 Advanced laser dentistry technology allows us to provide more conservative treatments. There are no stitches necessary, and patients who undergo laser gum treatment usually experience zero discomfort and swelling after the procedure. Because laser technology promotes accelerated healing, recovery is quicker and more comfortable. If you have resisted having dental conditions treated due to anxiety, it’s time to learn more about how laser dentistry can benefit you. The team at Sherwood Dental would love to have the opportunity to discuss how your dental experience can be quick, comfortable, and convenient with Waterlase technology. If you are in the Oakville ON area, please call us today at (844) 951-8855 to schedule your consultation.